Music by Richard Poole (Sebec River Publishing, BMI/Harry Fox), Marilyn Crispell (Crispell Publishing, BMI/Harry Fox), Gary Peacock (Mokuto Music, BMI/AMRA). Except: "Gary's Theme" by Gary Peacock. Titles #2 and #9 are lines from "Heart Shaped Blossoms" by poet Frank Parker. Recorded November 6, 2014, at Nevessa Production Woodstock. Engineer: Chris Andersen. Mixed and mastered by Chris Andersen, Nevessa Studio, Woodstock. Cover art and graphic design: Jonas Schoder. Photo: Chris Andersen. Liner notes: Bill Shoemaker. Produced by Richard Poole and Intakt Records, Patrik Landolt. Published by Intakt Records. ﻿Nevessa' is a recording studio in the town of Woodstock, New York state, where pianist Marilyn Crispell is based. There she met up with drummer Richard Poole and bass player Gary Peacock in November 2014 for a session of creative improvisation. The result was ten beautiful pieces of music which document the great art of spontaneous music-making and underline the outstanding personalities of these three fantastic musicians. 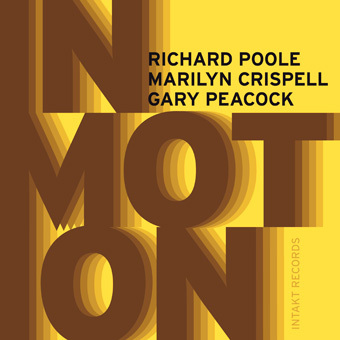 "In Motion exudes rapport, whether Marilyn Crispell, Gary Peacock and Richard Poole ruminate upon attenuated melodic contours, charge through jagged motives, or ride buoyant grooves. It is the type of rapport that suggests a long incubation of materials and processes," says music journalist Bill Shoemaker in the sleeve notes. "There is the lucidity and heart that comes from the time and space needed to hear feelingly, as well as the flexibility to effortlessly pivot between starkly contrasting materials, as Crispell, Peacock and Poole do repeatedly throughout the album." 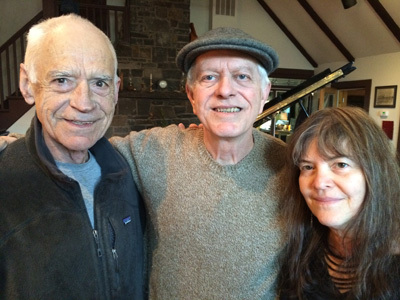 ﻿Im Nevessa Aufnahmestudio in Woodstock, dem Wohnort von Marilyn Crispell, trafen sich im November 2014 das Trio um den Schlagzeuger Richard Poole, den Bassisten Gary Peacock und die Pianistin Marilyn Crispell für ein freies Zusammenspiel. Zehn wunderbare Stücke, aus dem Moment entstanden, zelebrieren die grosse Kunst der Improvisation des Jazz und bezeugen die über­ragenden Persönlichkeiten der spielenden Musiker/in. Es gibt die Klarheit und das Herz, die entstehen aus der Zeit und dem Raum, der notwendig ist, um mit Gefühl zuzuhören, und die Flexibilität, um mühelos zwischen kontrastreichem Material zu navigieren, so wie es Crispell, Peacock und Poole immer wieder bei dieser Aufnahme tun."